Yes, this is actually a comedic musical based on the beloved book by Louis Sachar. Unauthorized, to be clear. Holes is a book that I reread many a time in my youth. I also saw the film adaptation starring now-notorious Shia LaBeouf, and I remember feeling a lot of weird melancholy about it. This musical, however, seems to be a lot more absurd and wacky in the vibes department. Wow, wait. 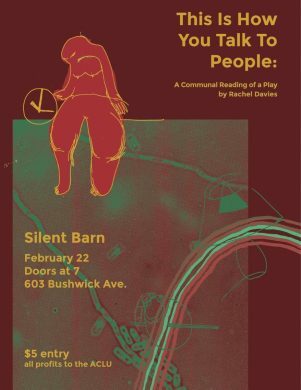 My friend Noah made this show, so I have known that this is happening for a while now. 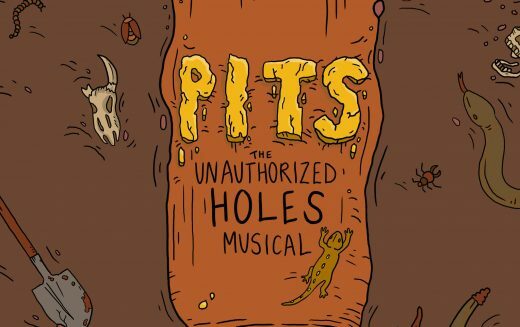 However, I literally just now realized that a show called PITS is running at The PIT. Please pat yourself on the back if you are quicker in the brain department than I, and even if you aren’t, I’m sure this will still be an enjoyable show to see. 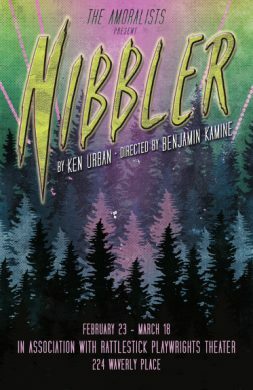 Ethan Lipton (who was behind the delightfully odd and cactus puppet-filled Tumacho at Clubbed Thumb last summer) returns to The Public with this bluesy, folksy musical about two people who purchase an old spaceship with the goal of leaving Earth behind in order to explore the final frontier. The show is directed by Tony nominee Leigh Silverman, who also directed Lipton’s prior piece at The Public, No Place To Go. 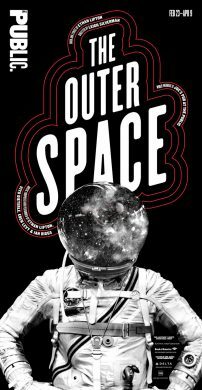 Rather than being staged in one of the building’s mainstage theaters, The Outer Space will happen in cabaret/bar space Joe’s Pub, with an accompanying prix-fixe menu that can be gobbled up while your eyes consume some culture. And with all that’s happening on Earth nowadays, you may be inspired by this space travelin’ show to act accordingly. The word “nibbler,” is a curious one that calls to mind many things. Personally, what immediately entered into my brain was something like a mouse gnawing off very small amounts of cheese over a long period of time. I do not think this new play by Ken Urban, presented by The Amoralists, has many mice slowly eating cheese. However, it does center around a group of friends in New Jersey in 1992. They’ve just finished high school, and they may or may not have encountered a being from out of this world. Literally. Also, there is music. Will the music also be out of this world? Only time will tell. 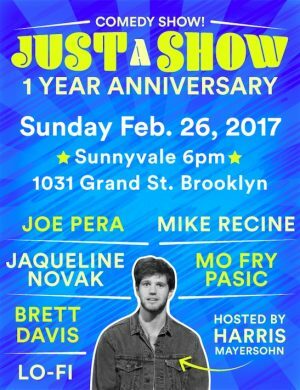 This Sunday marks the one-year anniversary of Just A Show, a charming afternoon comedy show at East Williamsburg venue Sunnyvale. If you’re looking to crawl somewhere after brunch hours have ended, this could be your best bet. Just A Show’s tasty celebration lineup ready to serve you up heaping scoops of stand-up, sketch, and more includes hosting duties by Harris Mayersohn and performances by Brett Davis, Joe Pera, Jacqueline Novak, Mo Fry Pasic, Mike Recine, and “garbage comedy” group Lo-Fi NYC.